The Berkeley Springs International Water Tasting, the world’s most prestigious, gave out awards tonight to waters from three continents. The municipal water category was a battle of champions. The top five water winners were all former gold medalists at Berkeley Springs. Village of Montpelier, OH’s water came in first judged as the Best Municipal Water in the World. All the municipal winners are American waters and most from middle America. Emporia, KS took second place while the City of Hamilton, OH won the bronze. Metropolitan Water District of Southern California placed 4th and Independence, MO, 5th. Artesia, Crystal Falls, MI and Canadian Gold Artesian Water, Marchand MB, Canada. Svalbaroi Polar Iceberg Water from Norway placed third while another artesian water, Planet H2O Natural Artesian Water of Knoxville, TN placed 4th. Fifth place winner was Whistler Water, Burnaby, BC, Canada. The audience was filled with water enthusiasts coming from as far as New Zealand and Norway. Eleven media judges spent hours tasting and selecting from waters sourced in 19 states, five Canadian provinces and 12 foreign countries. “There were waters from two new countries this year: Costa Rica and Fiji. They joined waters from Italy, Bosnia, Greece, and Australia” said Jeanne Mozier, an event founder. Sparkling waters are sourced from eight countries. The best sparkling water in the world was last year’s winner, Tesanjski Kiseljak, Tesanj, Bosnia tied with 2016’s silver medalist Touch Sparkling Mineral Water, Marchand, MB. Winning silver this year was Otakiri Reserve, from New Zealand. Third place was Aqua Nobel Carbonated Water from Sweden and 4th was Oro Luxury Water from Macedonia. Another New Zealand water, Antipodes Sparkling Water placed 5th. The crowd was interested in the peoples’ choice packaging competition where it was their votes that chose which of the seven entrants was the most alluring. They voted the gold by an overwhelming margin to Svalbaroi Polar Iceberg Water from Longyearbyen, Norway. A pair of New Zealand waters won the silver and bronze — Waiheke Imperial was second and Antipodes, third. The eleven media judges selected by Klein Rone included representatives from various regional and national media including television and online magazines. They were instructed by von Wiesenberger to look, sniff and taste each water under guidelines similar to those in a wine tasting. The waters were rated for each attribute including appearance (it should be clear – or slightly opaque for glacial waters), aroma (there should be none), taste (it should taste clean), mouth feel (it should feel light), aftertaste (it should leave you thirsty for more). Waters were tasted in four separate flights over two days. 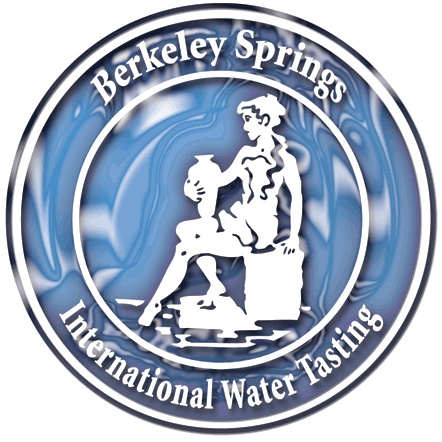 The 28th annual Berkeley Springs International Water Tasting is scheduled for Saturday, February 24, 2018. The event seminar on Friday and Saturday’s award ceremony were live streamed on the Berkeley Springs, WV Facebook page operated by the Morgan Arts Council’s Digital Media Center. For more information on Berkeley Springs or its water tasting, call 1-800-447-8797 or check the website. 4th – Thermodx Thirst Alkaline Water, Toronto, Ontario, Canada.